Instead of taking care of your skin with skincare products that contain harsh chemicals, you can switch to the following home remedies for glowing skin that can help restore the natural skin health and give your skin a natural glow. If you want to add a natural glow to your skin by using some natural ingredients, this article may be helpful for you. 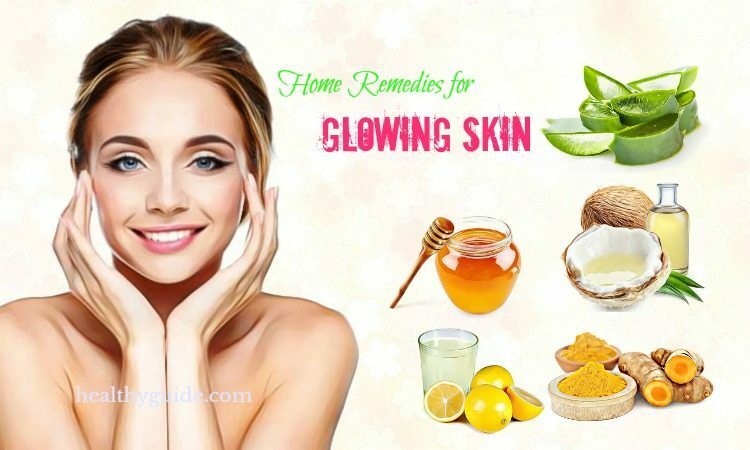 In this article, we will reveal some of the best home remedies for glowing skin in summer that you can make with ease at home. Now, take a look at Healthy Guide! There are some face pack recipes that you can help you improve your skin texture and also give it a natural glow. All of these face packs use natural ingredients, so you do not need to worry when applying any of these face packs at home. This is the first one among ayurvedic home remedies for glowing skin for dry and oily skin that we want to mention in this article. Raw honey contains great properties that are good for skin health. So, you can get a youthful and glowing skin by using raw honey. This home remedy also help you treat blemishes and acne. Gently apply this mixture on your face. Read on 31 Best Natural Ways To Use Honey To Improve Skin, Hair, And Nails to discover some of the best ways to improve skin, hair and nails with the help of honey. Turmeric contains powerful anti-inflammatory and antioxidant properties. It will help fight the harmful free radicals causing skin damage. Besides, it also stimulates the collagen production, hence keeping your skin glowing and supple. Meanwhile, gram flour cleanses your skin in a gentle way, making it clean and bright. Then, add the deficient amount of milk or water to create a paste. Repeat this home remedy once or twice per week. List of 44 Ways To Lighten Your Skin Naturally In 2 Weeks That Work For People At All Ages will show you some of the best ways that can help lighten the skin naturally, so check it out! Aloe vera gel is known as a great solution for many skin problems. It contains nourishing and healing properties, so it can give your skin a natural glow. Then, gently apply this mixture on the face. Repeat this home remedy up to twice a week. 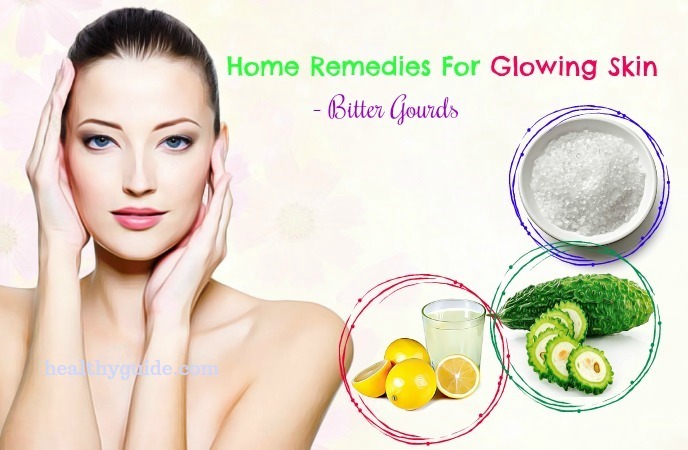 If you want to know about home remedies for glowing skin for oily skin that you can make at home, then you can try mixing lemon juice and sugar. The sugar granules can help remove dead skin cells from your skin while lemon can bleach, and cleanse your skin. Then, apply this mixture on your face. Gently massage in circular motions and let it sit on for 10 minutes. 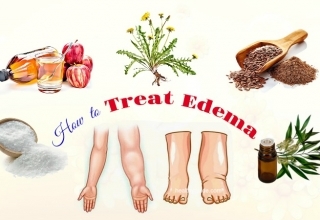 This remedy is very effective in dealing with dry and dull skin. This is because coconut oil traps the moisture in your skin and also conditions it thanks to its essential fatty acids. Besides, according to a study about beauty benefits of coconut oil , its phenolic compounds can give your skin a natural glow. Apply the warm coconut oil on your face. Gently massage for several minutes in circular motions. Leave it on overnight for the best results. Reapply this remedy every night before you go to bed. Cucumber contains antioxidant properties, so it can help rejuvenate your dull skin. 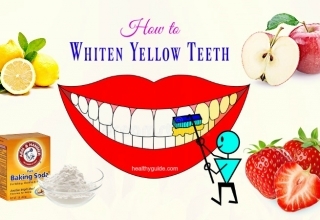 Also, it improves skin complexion and simultaneously reduces swelling. Grate a small cucumber and then add 2-3 tbsp. of plain yogurt to it. Mix both of these ingredients well. Leave it on for about 5 minutes before rinsing it off with cold water. Repeat this home remedy once every 3-4 days. If you are looking for home remedies for glowing skin for oily and dry skin, then you should not skip this face pack recipe. Baking soda removes dead skin cells and simultaneously balances out the skin’s pH levels. 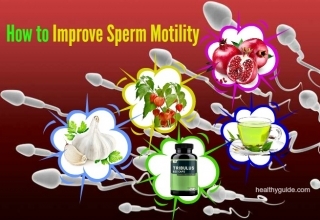 It also heals skin inflammation, and relieves the skin. Mix 1 tsp. each of baking soda and olive oil with ½ tsp. of raw honey in a bowl. Then, apply this mixture on your damp face and massage in circular motions. Follow up with your moisturize. Ripe papaya contains an enzyme called papain, which works as a mild exfoliator. So, it can gently remove dead skin cells from your face and make it look more youthful and glowing. Besides, it also clears the excess oil and dirt on the skin surface, which is a common cause of acne and breakouts. Meanwhile, Fuller’s earth can absorb the excess oil from your skin, making it supple and soft. Honey can moisturize, hydrate your skin naturally and also helps reduce the appearance of blemishes on your skin. Then, add 1 tsp. each of Fuller’s earth and honey to it. Mix all of these ingredients well to create a paste-like consistency. Now, apply this paste all over your face. Leave it on for about 20 minutes before rinsing with cool water. Sandalwood is well-known for its ability to improve the skin complexion. It provides your skin with an instant glowing look and you can use this ingredient on a daily basis. Mix some sandalwood powder with rose water to create a paste. Wait until the paste dries out naturally. Finally, remove the paste using warm water. 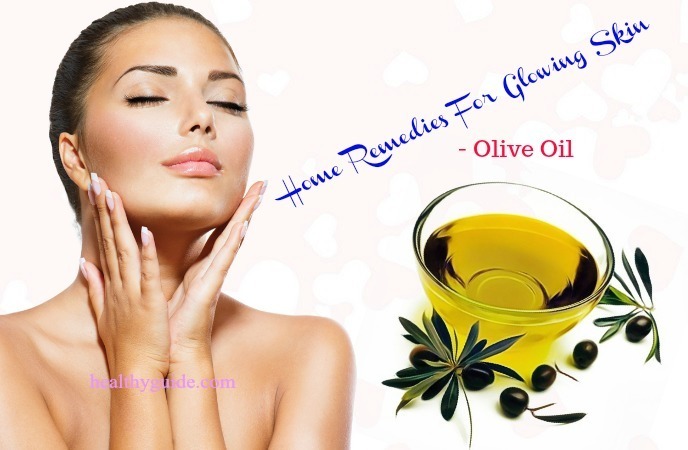 One of the best home remedies for glowing skin for dry skin and oily skin that has been used by many people is using olive oil. Olive oil is a natural skin moisturizer. Besides, the flavonoids and polyphenols found in olive oil can help protect your skin from harmful free radicals that cause skin damage. Also, olive oil can repair your damaged skin cells, making them healthy and glowing. Apply 1 tbsp. of extra virgin olive oil all over your face. Gently massage in upward circles for about 2-3 minutes. Then, soak a clean towel in some warm water, squeeze the excess water, and then place it on your face for about 30- 40 seconds. Soak this towel again in warm water and then use it to wipe away the olive oil. Repeat this remedy every night before you go to bed. Cod liver oil is high in vitamins A, D, and omega-3 fatty acids, all of which nourish the skin, heal damaged skin cells, and give a radiant glow to your face. Cut open the cod liver oil capsules and take the oil present inside. Gently massage it for 1-2 minutes. The powerful antioxidants found in carrot juice can protect the body from harmful free radicals. Besides, according to a research about carrot health benefits , carrots are also rich in vitamin A and beta-carotene, which helps improve your skin texture and your eyesight as well. Cut a small piece of ginger and 5 carrots into pieces and then extract out their juice. Reapply this remedy every alternate day. Do you want to know other ayurvedic home remedies for glowing skin for dry and oily skin? 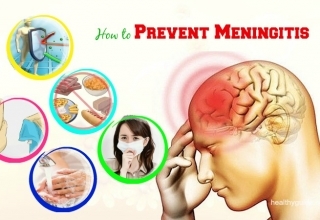 If yes, you should continue to read the remaining of this article and then consider applying any of these natural remedies for good. Orange juice can naturally detoxify your body. Its high content of vitamin C clears your skin complexion, giving it a glowing look in no time. Then, add black pepper and salt to taste before you drink the juice. This is a great formula for radiant and healthy skin. Raw milk contains saturated fat, calcium, protein, and vitamin C, which are good for skin health. Also, according to a study about honey for face , honey is well known for its antibacterial and moisturizing properties. Mix 2 tsp. of raw milk with 1 tsp. each of gram flour and honey to form a paste. Repeat this home remedy twice a week. This face pack recipe is worth mentioning in this list of ayurvedic home remedies for glowing skin for oily skin and for dry skin thanks to its benefits for skincare. Orange peel is rich in citric acid and vitamin C, which can relieve acne and refresh the skin. Besides, it also gives the skin a natural glow. Then, mix it with 2 tsp. of rose water to create a paste. Apply this mixture all over your face and let it sit on for 15 minutes. Finally, wash it off using cool water. Repeat this remedy once every several days. Another one among home remedies for glowing skin in summer is using this saffron face pack. Saffron has been used to maintain naturally glowing skin for years. Its high content of antioxidants can help keep your skin healthy. Soak a few saffron strands in about 1 tbsp. of honey for several minutes. Then, apply this saffron-infused honey on your face and neck. Reapply this home remedy 3- 4 times a week. Bitter gourd can improve your digestion and simultaneously eliminate all infections. Besides, it t can purify the blood, making the skin glowing from within. Peel 2-3 bitter gourds, remove their seeds ad wash them thoroughly. Then, cut them into small pieces before mixing it with 2 tsp. of fresh lemon juice. Drink this juice once daily or once every alternate day. When it comes to learning the best home remedies for glowing skin for dry skin and for oily skin, this face pack is really great for dry and damaged skin. Bananas contain many essential nutrients such as vitamins A, B, C, E, potassium, and zinc, etc. All of these nutrients can nourish and hydrate your skin, making it soft and glowing. Then, apply this mixture on your face and neck. Next, rub an ice cube all over your skin area for several seconds. Rose water is often used as a natural skin toner. 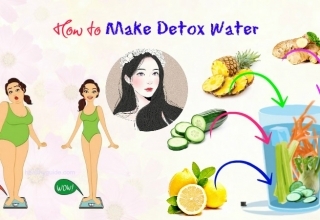 It can cleanse and refresh your skin. Addition to this, it can brighten your skin tone by increasing blood circulation and balancing the skin’s pH levels. Keep some rose water in the refrigerator for about 30 minutes. Then, apply the rose water all over your face using a cotton ball. Repeat this home remedy twice a day, in the morning and evening. Another one among the best ayurvedic home remedies for glowing skin for oily skin and for dry skin is using green tea, which is highly recommended for many skin problems. According to a research , green tea leaves contain flavonoids, which help maintain the production of collagen in the skin. Besides, it also maintains the skin’s elasticity, making your skin glowing, and wrinkle-free. Firstly, boil 1 tbsp. of green tea leaves in a cup of water. Cool it and then take 2 tsp. of green tea in a bowl. Apply this mixture all over your face and gently massage in circular motions. Reapply this remedy once or twice per week. This is a face pack recipe for glowing and healthy skin that has been used by many people. The combination of the lentils, oatmeal and raw rice will help remove dead skin cells and dirt from the skin. Meanwhile, turmeric will reduce the appearance of blemishes and provide the skin with a natural glow. Almonds also hydrate the skin thanks to its essential oils. Firstly, grind a cup of split red lentils, ¼ cup of raw rice, and 9 almonds. Add ½ cup of oatmeal and a pinch of powdered turmeric to the powered mixture. Blend them well and add the sufficient amount of rose water to create a smooth paste. Now, apply this paste on your face and neck. Leave it on until the pack dries and wash with clean water. In regard to learning home remedies for glowing skin in summer, you can try using this face pack recipe. Neem seeds can be used to treat many skin problems. The paste made from neem seeds can help remove toxins from your skin and provide your skin with a glowing look. Grind some neem seeds to create a fine powder. Add almond oil to the neem leave powder. This is another one among ayurvedic home remedies for glowing skin for dry and for oily skin that you should know and then make use for good. Black sesame is also a great solution for blemishes and black spots. It also makes your skin glowing and clear. Grind some black sesame seeds to make a fine powder. When you are looking for the best ayurvedic home remedies for glowing skin in summer, you can try out this face mask recipe. 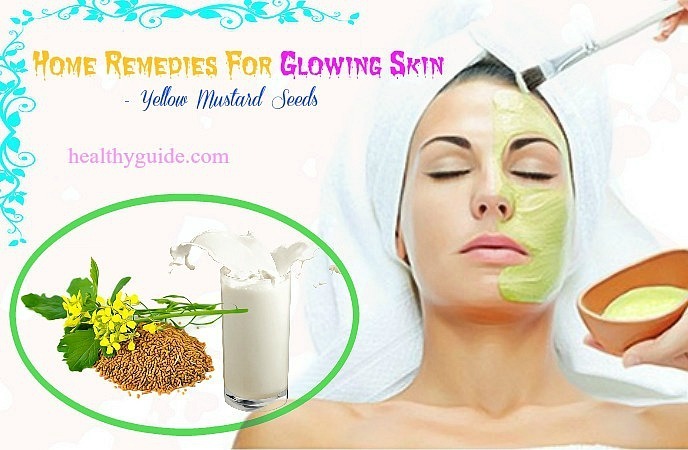 Actually, using yellow mustard seeds is an ancient remedy for restoring glow of the skin. Firstly, take 1l of milk in a pan. Now, simmer it until only the seeds remain. Place the mixture under sunlight so that all of the water content can be removed. Apply the yellow mustard seed powder on your face. Apart from applying any of the face masks as we mentioned above, you also need to make some diet and lifestyle changes to bring a natural glow to your skin. This is known as one of the ayurvedic home remedies for glowing skin for oily and for dry skin that you should not look down. Keep in mind that keeping the skin hydrated all the day is the key to your glowing skin. You can massage your face and body with an herbal oil every day. These beneficial herbal oils can give hydration to your skin cells and also make the skin soft and supple. And then, you can experience a bright and youthful skin. Following a healthy diet is one of the most important steps for getting a glowing skin. Make sure that you include fresh and healthy foods in your daily diet plan. It will repair damaged skin tissues, deal with skin problems, regenerate skin cells, and finally make your skin smooth, glowing and supple. Physical exercises have positive effects on the skin, including giving energy, increasing blood circulation, making joints and muscles stronger, improving flexibility, eliminating digestive problems, helping in detoxification , treating some diseases and improving moods. Therefore, you should follow a daily workout routine if you want to get a glowing skin. When it comes to improving skin texture, you should have at least 7-8 hours of night sleep. You can drink some warm milk right before going to sleep. Also, you should avoid performing stimulating activities before bedtime. 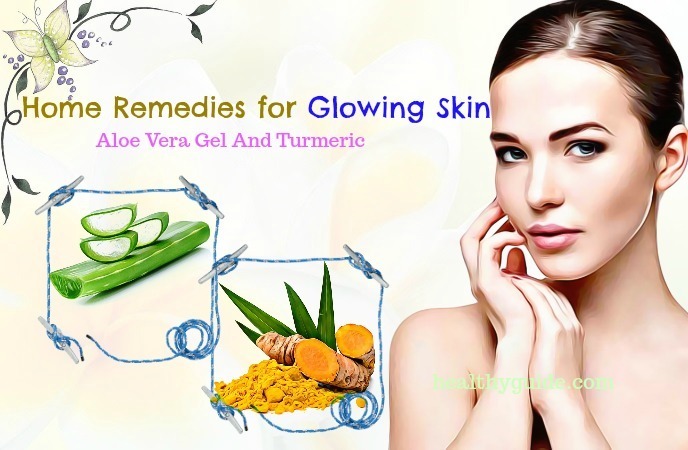 This is the last yet effective one among ayurvedic home remedies for glowing skin for oily skin and for dry skin that we want to mention in this article and want all of my readers to apply for good. Stress and strain can make your skin dark, dull and aged. So, it is very important to reduce stress to keep your skin healthy and glowing. Meditation is an effective way to reduce stress, tension and anxiety. Hope that some of the ayurvedic home remedies for glowing skin for dry skin and for oily skin as we mentioned above are helpful for you. If you know other natural treatments that can add a natural glow to your skin, share them with other readers by leaving your comments in the comment section below. Also, you should visit our Beauty Category regularly if you want to know more about beauty tips.